Let Atlanta Pressure and Steam help make concrete cleaning and deck cleaning affordable and fit into your budget. We are now serving Atlanta, Lawrenceville, Doraville, Suwanee, Tucker, Snellville, Alpharetta, and Duluth. Call today for a FREE Pressure Washing Estimate (770) 884-4103. Atlanta Pressure Steam & Repair of Lawrenceville, Ga provides expert concrete cleaning & deck cleaning to Suwanee. Residents from all over Atlanta have experienced the the complete cleaning process of our expert technicians: cleaning driveways, staining decks, pressure wash fence, clean motor oil from driveway, remove wood stains, clean and stain fences, and sidewalk cleaning. We have over 10 years of experience, and we have a total commitment to your complete satisfaction, respect for our fragile environment and your property. We provide a 7 step process to insure that we remove all stains to make your driveway, deck, fence or sidewalk look like new again. Our cleaning system is proven to remove mildew, algae, dirt, grime, chewing gum and most rust stains. Did you know that mildew and algae will ruin underlying paint if left too long? It can also cause a slip & fall incident when wet. 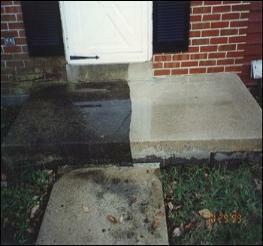 We use high pressure power washers & surface cleaners to make your surroundings safer & cleaner. Our method does not leave “zebra striping” on the surface or harm the surrounding environment. Concrete cleaning is one of the most complex tasks in the pressure cleaning trade. Concrete is very porous which allows dirt and other debris like gum, engine oil to bed deep into the concrete, resulting in a situation where high powered commercial pressure cleaners accompanied by professional concrete cleaners are the only sure means of removal. Concrete cleaning requires physical conditioning to handle large projects like cleaning concrete driveways. Your driveway, paths and sidewalks are often the first thing others will notice when they arrive at your home. You may not even realize how clean concrete can look after having it professionally pressure cleaned. Let us keep your concrete looking like new. But before you purchase a wood sealer from your local home improvement store, you should know that sealing decks is only one part of what it takes to do the job properly. Before deck stains or sealers are applied, the wood needs to thoroughly washed and cleaned with a pressure cleaner to remove the dirt, grime, and soil that has been imbedded deep into the wood’s grain. For most homeowners (and inexperienced professionals), using a pressure cleaner on wood can be very difficult. It is very easy to damage your deck inadvertently. We will not only restore your deck to like-new condition, but you can rest assured that the work will be done correctly and without the worry of damage, providing for years of future enjoyment.